Despite not being perfectly blended on top, I liked it from bite number one and my love grew from there. I now understand why people clamored for this one to come back. When you dial in cotton candy softserve, there is just this great soft texture to sugary flavor balance that is hard to beat. It hits this special sweet spot and yeah, I'm loving every bite. I did need to work the blizzard a little as the cotton candy flavor wasn't 100% uniform at first, but after a little bit of thoughtful scooping I got things going. There wasn't a ton of sprinkle action going on for awhile, and admittedly I was thinking about if I wanted a little more excitement, but then there were some larger bits near the bottom and they were great. They have a really nice, easy sugary crunch. Just little bursts of crisp flavor. I'd say add another scoopful of them to be safe but would that over-flavor the oh so pleasant base? Yeah, I made short work of that blizzard. Rarely do I want a second one (a small is usually sufficient) but boy do I want another one today. Now granted the lingering sweetness is a little much, a couple of french fries wouldn't hurt right now, but still, I enjoyed every single bite of this blizzard. Oh man, I hope they serve this one all summer long! Ok, in closing, this was an awesome blizzard and I hope to sneak this in to my routine on multiple occasions for as long as it's available. A small part of me is tempted to throw in another mix in like "crust" pieces, but I'm going to sleep on that. If you are stoked for it's return, or just happy to finally try it for the first time, let us know! Wait, what if there was a royal shake version?!? Doh! "royal" shakes are off the menu! Note: This was available for May ONLY though I had hoped it would stick around all summer long. It feels like a missed opportunity, but hopefully it will come back around next year. Looks good! I happened to spy another interesting flavor in the menu photo that you posted - Peanut Butter Cookie Dough Smash. yup, it's a "fanniversary" blizzard, I will definitely be trying it at some point! I was at my local Dairy Queen one day just messing around with the person behind the counter - You know, making bizarre requests for Blizzard flavors. Get this. The guy told me that if someone ordered a hot dog and french fry Blizzard that they will make it for you - At least that location will. Just a thought for a later review. Chicken and Waffles blizzard here I come! I'm so bummed that the closest Dairy Queen to me is sub par. Every time I'm there the blizzard has ice crystals throughout and virtually no mix ins (no matter what flavor i order) and they've had they didn't offer the April Blizzard of the Month. For Shame, DQ, FOR SHAME! @TheHollows: ouch, i have one DQ that is slow with the deliveries, but the product is still excellent. Who runs that joint?! DQ didn't bring back the same recipe. There's no cotton candy syrup, and the mixins are slightly different. I had a mini cotton candy blizzard today, and it was the worst blizzard I have ever had! I don't know whether it was a problem with the way it was made, but over half of the blizzard was made up of large, hard chunks of what I assume were frozen cotton candy pieces. If this had been my first experience at DQ, it would have turned me off of them completely. On a side note, I heard they have discontinued their marshmallow sundae topping; marshmallow sundaes are my number one go-to item at DQ. What are they thinking?? @Scotland: sound like someone was eyeballing the mixins rather than using a scoop :) not sure about the marshmallow, but I can ask. I am not really a cotton candy fan - but I thought this was surprisingly good. I felt the same way about the cotton candy Oreos (it seems that I may need to revisit my claim that I am not a cotton candy fan). Try this Blizzard. Hmmm ... and maybe add a Cotton Candy Oreo to it! I have worked at DQ for 9 years and this is definitely the same recipe. It comes with cotton candy syrup and the same mix ins. 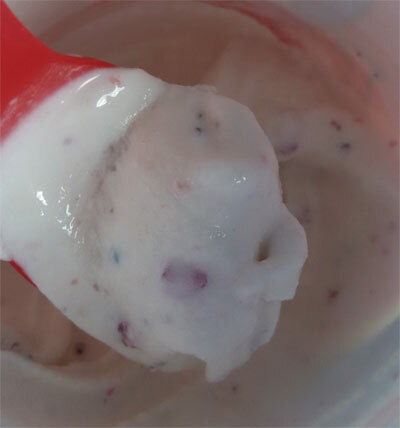 When DQ first released the cotton candy the syrup once was a cone dip that hardened and then broke into little chunks (like chocolate chip). That was only for the first year offered though I believe and then they changed it to a syrup which is still apart of the recipe! It looks like the DQ that served the blizzard in the picture did not put in the right amount of ingredients. It's too white! @CJX: thank you for the info! it was definitely pretty white when I got it, but it did turn light pink after I mixed it up a bit). If I get another and it's more pink, I will post a followup for good measure. apparently my dq (crestwood ky) is too cool to have this blizzard. Its my favorite and the said they didnt have it. Very dissapointed. I never liked Blizzards.. ever.. until I had this one! That was years ago and I was so bummed when they got rid of it years ago. Imagine my happiness when it was back! I Had it once in STL and it was perfect. Next I had it in IL (near where I live and they were shipped the syrup but not the candy bits). They put sprinkles in for me, but it just wasn't the same.. still good though. I'm looking forward to going to the STL location this afternoon and getting a large! I hope they keep this on the menu forever! This is literally the only reason I ever go to DQ. I know i'm not the only one either. 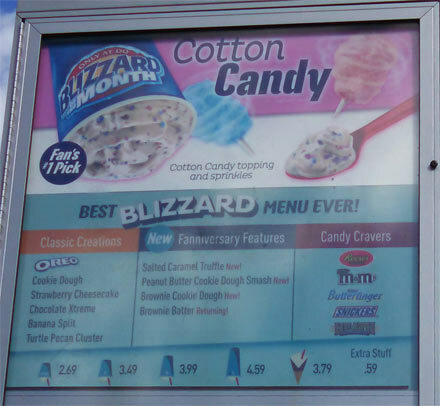 If this was voted the most popular blizzard flavor then why the hell isn't it on the menu 24/7 365?! Typical overthinking by a FF chain. 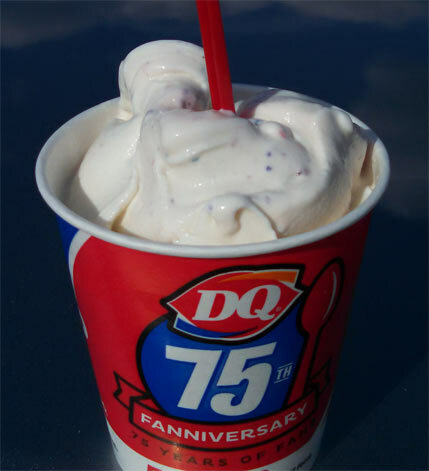 I fell in love with this tasty treat over the summer and was disappointed when it was gone... Until I realized there was still one DQ in my city that still sells it!! It must have been a pretty popular item (or I ordered it way too frequently) that they told me it was a Blizzard of the Month but they sold out the first week... Whaaaa?? Well now I literally just went back again tonight to my standby DQ and it is now present on the menu under Blizzard flavors. This girl is doing the happy dance! My local DQ just ran out of it at the end of sept. So disappointed. The owner says they have to just guess how much to order to make it for the month that they advertise it. So if it goes fast, then it's gone, or they order a lot and have it for awhile. I think it's the best blizzard ever. I always ask for extra syrup and candy !! I also had a blizzard cake made with it. Was it served to you upside down? This is absolutely the best blizzard ever!! They need to bring it back permanently. Super crunchy cotton candy pieces don't harden up and taste like wax like their chocolate add-in blizzards do. Tried it for the first time yesterday and I, too, was missing the cotton candy flavor but was wowed by the crunchy sweet bits and pieces. Their texture saved the day because the ice cream in itself was meh and didn't taste like cotton candy at all.